After a film screening five people hold a meeting. 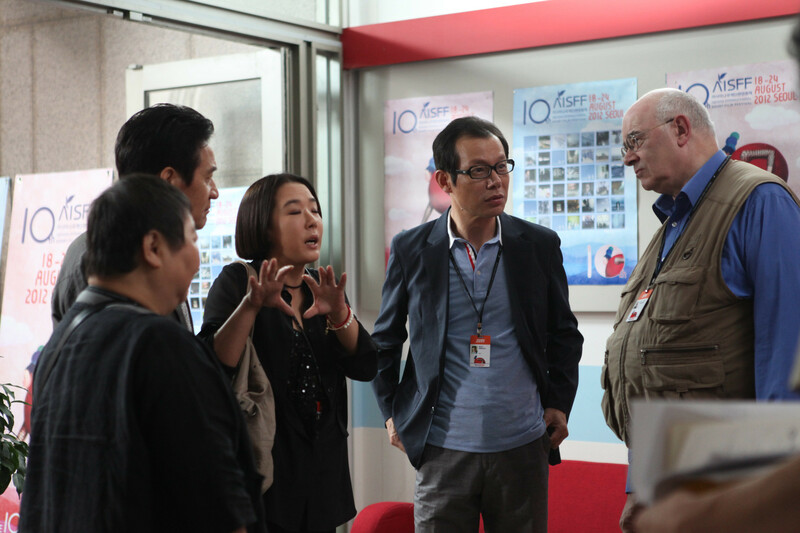 Director Jeong asserts that a film should move the heart. Actress Soo-yeon emphasizes on the message of the film and film critic Tony brings up the current trend of Korean cinema. Tomiyama cannot fully express her thoughts because of a language barrier and the head of jury, Sung-ki, can’t control the situation. Will this jury reach an agreement against all odds? Jury is a satire for those who make, watch, and criticize films. Kim founded Busan IFF (BIFF) in 1996. He was the festival director until 2010 and developed it into the most representative film festival in Asia. After he retired from the festival in 2010, he became the Honorary Festival Director of the BIFF and is now the director of the Graduate School of Cinematic Content of Dankook University to foster future filmmakers in Korea. He has earned various awards and medals for his achievements and efforts in promoting Korean cinema to the world. In 2012, he made his debut with the short film, Jury, for the 10th anniversary of Asiana International Short FF (AISFF).